Since 1999, China began to move from elite to mass higher education. During the rapid expansion in the last decade, two-to-three-year higher vocational colleges (HVCs) have played an indispensable role in achieving mass higher education objective by providing higher education opportunities for roughly half of all college students in the country. In short, the rapid growth of the higher vocational colleges is one of the most impressive landscapes in China’s higher education development. However, such a rapid expansion requires a collective financial responsibility among central, provincial, and local governments, especially as it determines how expensive it will be to individual student. Our case study assesses the financial support strategies that China’s governments at various levels employ to enhance the development of higher vocational colleges. Particularly, it describes two financial initiatives that the central government recently put forth: (1) the model vocational college construction project and (2) the national financial aid program. Our case study argues that it is too complicated to evaluate the effectiveness of these policy initiatives in terms of efficiency and equality due to the lack of data and the limitations of empirical studies in literature. 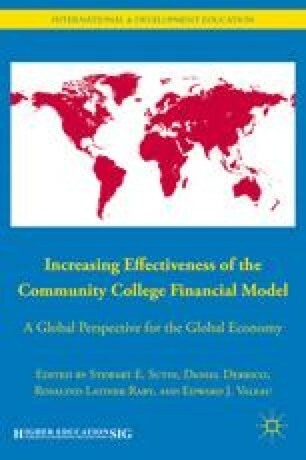 Consequently, employing financial data from some 100 “model HVCs” at an institutional level and aggregate data at provincial and national levels permits us to explore the role of tuition and fees in the revenue structure of HVCs and its inequality implications for both institutions with weak financial foundations and students from economically disadvantaged families.